You choose the dates that work best for you! HOPE YOU CAN JOIN US THIS SUMMER! Try one of our Daily trips! TRY A GUIDED TOUR ALL YOU NEED TO BRING IS YOUR PERSONAL GEAR! Summer is such a busy time, a very small percentage of people would book trips on the dates we choose for guided tours, so again this summer we are going to leave the scheduling up to you. Choose the dates of departure and return that best fit your schedule and give us a call. We can discuss the trips we offer and find an adventure to suit you, your family or group. July & August are our busiest times so call today! As always we offer canoe, kayak and paddle board rentals, shuttle service, and guided tours. Click on our Moose River Bow Trip link for full details on this trip. We have trips for all ability levels. Our adventures make a great family trip! We offer special pricing for groups over 6 and children 12 years of age and under. We reserve the right to change locations of trips due to water levels and weather. Please give us a call, we are very flexible. 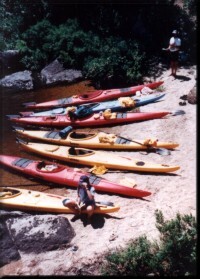 For those of you who like to go out on your own, we offer our kayaks and canoes by the day or for multi-day trips. Shuttle service is provided with our 15 passenger van. All tours include all food and drink, equipment, instruction and Registered Maine Guides. We provide everything except your personal gear.